We’re extremely lucky when it comes to biking in Calgary. 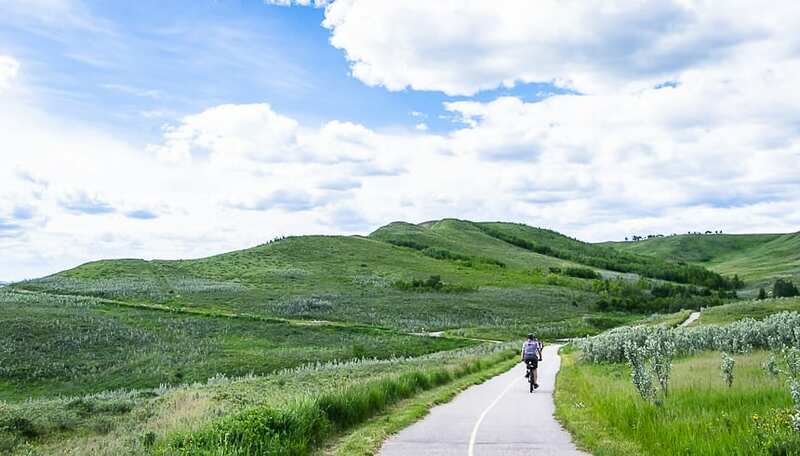 According to the City of Calgary “there are approximately 900 kilometres of pathways and 400 kilometres of on-street bicycle routes within the city.” None of these numbers reflect the opportunities for biking in Fish Creek Park. 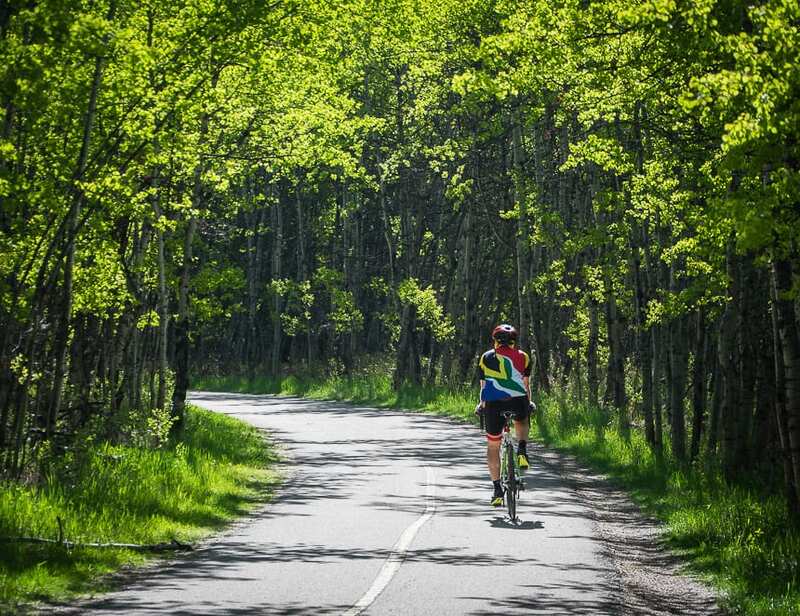 These five standout bike rides showcase the best the Calgary area offers. This is my go to bike ride in Calgary as it’s easy to access from my house near the downtown core. There are a couple of ways you can do this trail. You could of course drive to the reservoir, park and do the loop. 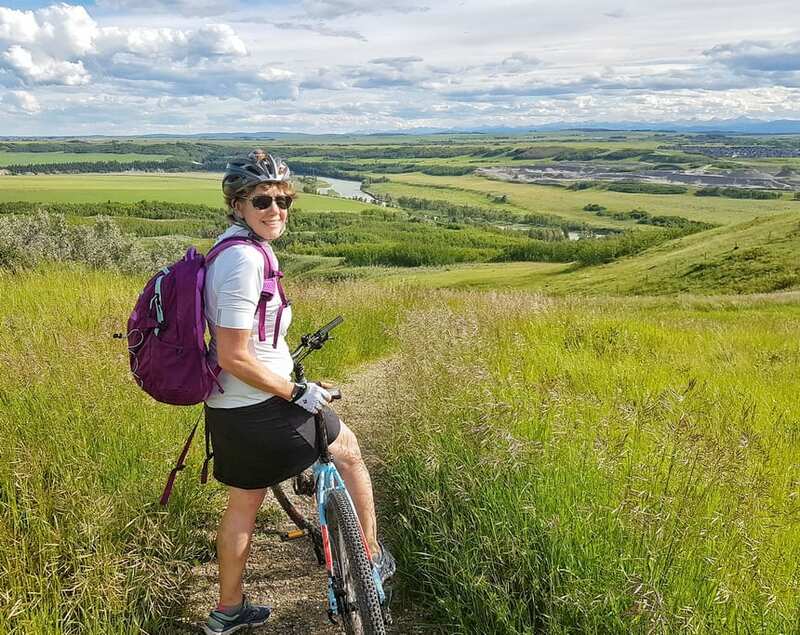 But if you want to avoid the car, take the trails – either the Elbow River Pathway or the one coming up from the south that deposits you near the Weaselhead part of the loop. This 16 kilometre trail can get really busy with walkers on a weekend. I like to go early in the day or in the evening. Glenmore Landing has a Good Earth Cafe which makes a nice stop along the route. Do this trail with your mouth closed in the summer so you don’t swallow bugs. Enjoy a waterfront setting with distant mountain views and a lovely long stretch through aspen trees that glow yellow come the fall. The Road to Nepal lives up to its name as is climbs approximately 600 metres over 55 scenic kilometres. If you’re new to Calgary, you’ll quickly see that the area around the city is a mix of flat and rolling hills, including many that will test your conditioning program. 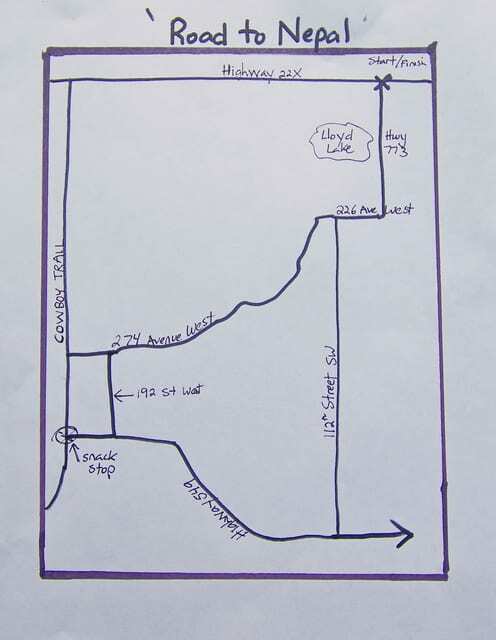 Start at the parking lot at the junction of Highway 773 and 22X and do the loop shown below. It’s easy to add mileage and include a trip to Priddis and the backroads around this small community. Stop at Jane’s Cafe to refuel. Glenbow Ranch Provincial Park is just 25 minutes outside of Calgary via Crowchild and Highway 1A. Within the park are a number of trails suitable for biking. Start at the Visitor Centre and go down the big hill. Then either go west towards Cochrane on the Bowbend Trail or east towards Calgary on the Glenbow, Narrows and Bearpaw (gravel) Trails. If you go late in the afternoon you might just have the trails to yourself. It’s an exceptionally beautiful area – a rolling prairie landscape with lots of wildflowers and bird life. The paved trails are part of the Trans Canada Trail. There are plans to fully connect Calgary to Cochrane via a bike path in the next few years. 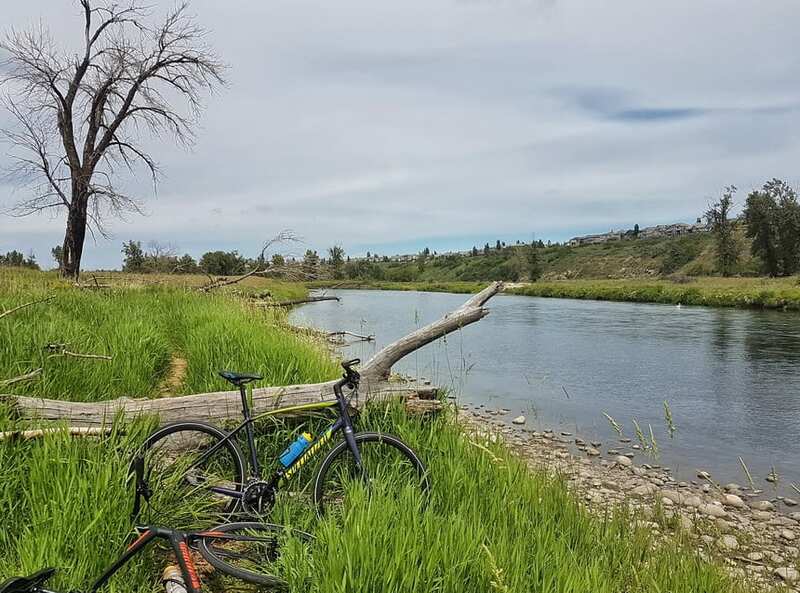 This may not be the prettiest bike ride you do in Calgary but you’ll see a side of the city you’d otherwise miss – the industrial heartland. Once you get past it you’re into some truly lovely countryside with horses, birds and wildflowers. All of the bike ride is on a dedicated albeit a sometimes bumpy bike trail. Pick up a bike trail east of the Calgary Zoo and stay on it as it heads over over Deerfoot Trail in the direction of the Max Bell Arena. Look for signs saying Western Irrigation Ditch Canal and follow it for 29 kilometres to Chestermere. The almost completed Calgary Greenway also called the Rotary/Matamy Greenway makes a 138 kilometre loop around the entire city traveling through 55 communities. Along the way it links parks, green spaces and natural areas and connects with the 1000 kilometres of existing pathways. On their website you can get more information about shorter sections. It’s also got a complete map showing the areas that are still under construction. Some can be easily bypassed while others will present problems in the short term. What do you think the best bike rides are in and around Calgary? Great recommendations here (can’t speak to the Ride to Nepal, as we’ve never done that one). Really looking forward to the completion of the connection between Calgary and Glenbow Ranch, so we don’t have to load our bikes on the rack and take them down that dusty gravel road to ride through the rolling Glenbow ranchland. @Denise I think we’ve got at least another year before that’s done but what a treat it will be. @Rob & Ann With a little looking and a bit of research you can always find something to ride that is worthwhile.